Planning and executing an exciting and memorable event doesn’t just happen overnight. Whether you’re planning a wedding, an intimate party, or a corporate event, the earlier you begin organizing, the more likely your event will be a success. Your guests will appreciate all the details, from the venue to the event caterer, the music to the decorations. It takes dedication to plan an event that is fun and rewarding for you and your attendees. Every event is unique, but there are a few fundamentals that, if followed, will ensure your event runs smoothly. 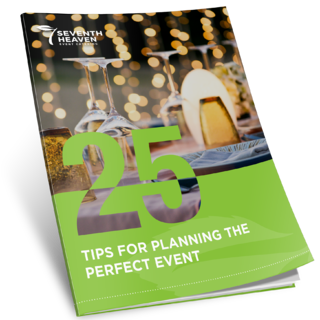 Learn about them with our list of 25 tips for planning the perfect event. Download this tip sheet to learn more about how to make your next event unique, exciting, and memorable.